Is this a match made in melodic rock heaven: vocalist Harry Hess (Harem Scarem) working with producer/musician extraordinaire Dennis Ward? Fans who miss Canada's now defunct Harem Scarem are probably sweating with convulsions. Well, that's the whole point of the First Signal project from Hess and Ward, and the artists are quite straight forward about it. First Signal resurrects the sound, ala Mood Swings or Weight of the World, that put Harem Scarem on the map and won them tons of fans worldwide. And that sound is a bit heavier than, say, the power pop tunes of Rubber. An abundance of words could be slaughtered in this review, but suffice it to say only a few things. Harry Hess is in prime form, sounding better than ever. His range, strength, and presence infect every song with enthusiasm. With Dennis Ward behind the deck, the production is nearly immaculate, crisp and sizzling with energy. And it doesn't hurt to have more than a few excellent songwriters to add steel to the foundation. 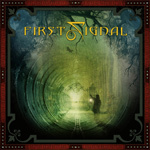 First Signal includes contributions from Tom and James Martin (Khymera, Sunstorm, House of Lords), Erik Martensson (W.E.T., Eclipse), Ronny Milianowicz (Saint Deamon), Robert Sall (W.E.T., Work of Art) and Mark Baker (Signal, House of Lords) among others. Dennis Ward on bass and guitar leads a stellar studio crew which includes fellow Harem Scarem mate Darren Smith. With these significant elements, there's not a single dull song on this album. My top picks would be When You Believe, Part of Me (very catchy), First Signal (a sure rocker), and Naked Desire (pure arena material). On First Signal, Harry Hess and Dennis Ward accomplish their goal of resurrecting the powerful Harem Scarem sound. For some curmudgeons this may be the only flaw here: recalling the past quenches any expectation of any ground breaking new direction or material. But that, obviously, was never the raison d'etre for First Signal. If you're a fan and have been wanting more Hare Scarem, then First Signal is that long awaited next album. Quite recommended. On First Signal, Harry Hess and Dennis Ward accomplish their goal of resurrecting the powerful Harem Scarem sound. If you're a fan and have been wanting more Hare Scarem, then First Signal is that long awaited next album.